The Puppy Coachies Treat Bag is ideal for training purposes or walks. This dog treat bag can be attached easily to any trouser, belt or pocket and has a closable drawstring to keep dog treats fresh. 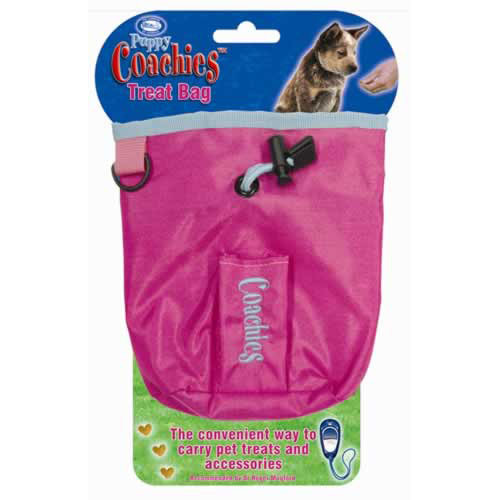 Puppy Coachies Treat Bag's also feature a special pouch for a clicker or poo bags. Rather than having pockets full of treats, or in some cases losing treats when a dog decides to help themselves while your back is turned, these dog treat bags make it easy to carry your treats and get to them easily - very important when rewarding your dog where timing is key during training. Also available in black as the Coachies Treat Bag. Easy access to your dog treats without fumbling around in your pockets. Closable drawstring to keep dogs noses out and the treats in. Easily attached via belt clip or ring attachment. Rainproof so you do not end up with a mess after a walk in the rain. Made from washable fabric for easy cleaning.